This will be my first attempt at writing a tutorial so feel free to give any criticism you feel is necessary… And if somebody has done this already, sorry. I believe in giving credit where it is due so let me know! Okay, on with it! Since I started slinging a little under a year ago I found myself constantly trying to make the “perfect” sling. Well, we all know that there isn’t any such thing, but I think that the LightSlinger Pouch is about as close to perfect as I can get (For me anyway..). 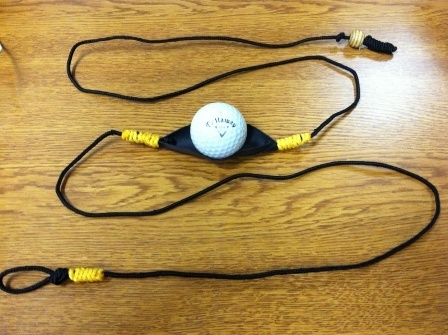 I wanted and needed a pouch with a quicker and cleaner release for throwing golf balls with a reduced amount of spin. It was pretty frustrating. I even toyed around with the idea of making an explosive release pouch that would fly away from the projectile faster than it could start to roll. 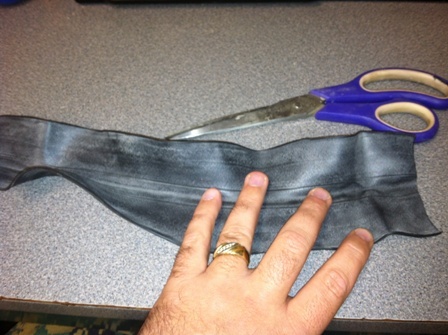 One day I was desperate for pouching material and saw an old bicycle inner tube being useless. I took a pair of scissors to it and got the LightSlinger pouch. 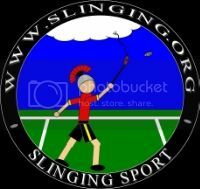 When I first tried throwing a golf ball with the new sling I was amazed at how smooth and fast the release was. I had been seriously concerned that the thin rubber would actually cause problems because of it’s stretchiness and was pleasantly surprised to find that not only is the stretch negligible, it also causes the pouch to open very quickly upon release as it springs back to it’s normal shape. This pouch type is very easy to make and a person should be able to make over two dozen of them with no more than a couple bucks (Or maybe nothing at all if you have the materials lying around like I did.) and about 15 – 20 minutes per sling. 1 standard bicycle inner tube. Whatever cordage you want to use for your retaining and release cords. The Slings I make with this use boot laces (the stiff kind). 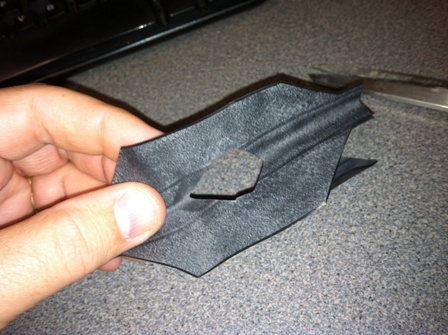 First, Cut the inner tube in half. 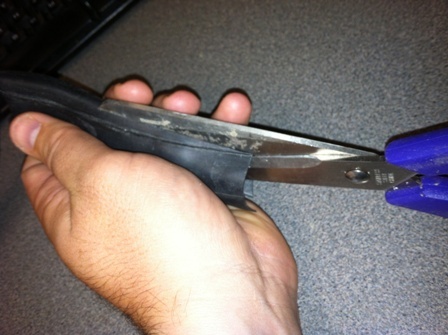 Then use the scissors to open the tube along one of it’s seams. It should look something like this... You'll probably notice right away that the rubber is a little rougher in the inside. make sure that this is the inside of your pouch and it will naturally create a lengthwise cupping. 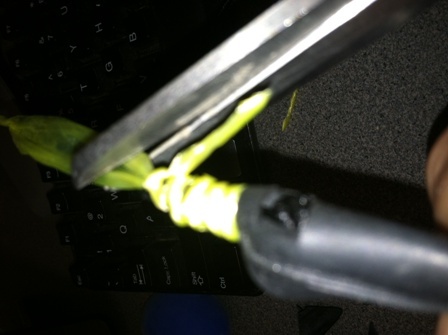 Begin Securing the cord to the pouch using a West Country Whipping. 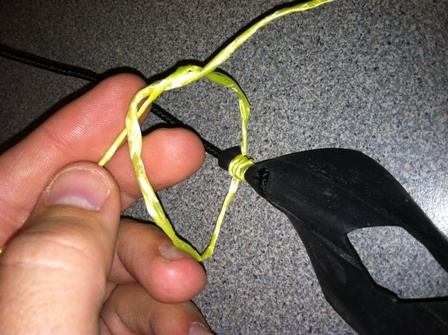 Just tie the alternating knot directly behind the stopper knot and work away from the pouch. 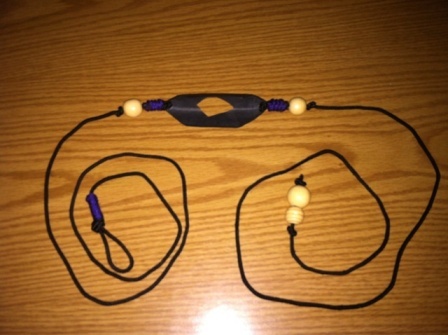 Tie the knots tightly and you'll find that they grip the rubber nicely. I usually do the whipping down the length of the rubber tabs and about half a centimeter onto the cord before I quit. Trim the ends of your whipping and heat seal if desired. And now you’re done with one cord. Just do the same with the other side, tie your retention loop and release knots and have fun! Tha's a pretty good tutorial. You may want to mention when and why you put the beads next to the pouch. How does the rubber compare to leather? How does it handle rocks? I could use another all weather sling and now I know what to do with all those old bike tubes. Thanks! NICE. but how does it use rocks? thats pretty much all ive got, except broken TV glass. @Walter: I'm glad you like it! I quite like its all weather aspect too and the rubber has just enough friction to hold those pesky slick golf balls even in wet conditions. Another thing I like about the pictured slings is that they are super compact. 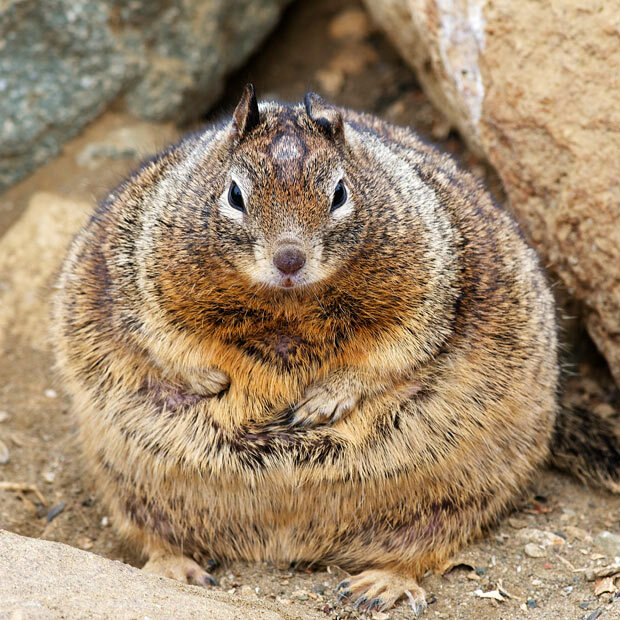 I can fit at least two or three in my pocket comfortably. As far as throwing rocks goes specifically, I love it! To be fair I feel that I must admit that I haven't had much opportunity to throw lots of rocks from these slings as I live in the city and have little free time to seek out places to launch rocks, but on the few occasions that I did have, it worked like a dream. I found it easier to put rifle spins on the egg shaped rocks I did get to throw than with any other sling I've ever used. I really have no idea how long the rubber will hold up to the greater friction of throwing rocks, but I think they may prove to be surprisingly tough. I'd love for someone to test this out and let us all know how they work out.. Yesterday I had the opportunity to finally spend some time throwing rocks with this sling. They were the nasty rocks that they use on railroad tracks (cause that's where I was). You know, the jaggedy quartz rocks with the black stone mixed in? They were pretty terrible as far as ammunition goes, but the pouch worked like a charm! I threw stones pretty much constantly for about 45 minutes without any noticeable wear on the pouch OR the release cord. Just thought you'd like to know. If anybody puts one of these together, let me know what you think of it! !